Today, I’m joining Alyssa Goodnight and Courtney Webb of Stiletto Storytime to celebrate the 200th anniversary of Jane Austen’s publication of Pride and Prejudice. I picked up “P&P” again last week in preparation for Let’s Talk About Jane (a sort of “Jane Austen-101” program that I host at my local library). We’re set to discuss the heroines within Austen’s novels — with Elizabeth Bennet of Pride and Prejudice topping the list. What is it about Elizabeth that makes her so appealing? What makes a great literary heroine? I’ve come to the conclusion that it’s several character traits: honesty, a sacrificial nature, and the courage to speak-up for what is right. No heroine starts out perfect. She matures and learns as her story progresses through personal conflict. She is usually — like all of us — flawed. Yeah, that’s right. Flawed. We’re all flawed. Stop kidding yourself if you think you’re an exception. We’re all (heroes and heroines alike) just living out our own stories, through the pain, through the confusion, through the prejudices that surround us and trying to make some sense of it all. We try to make the right decisions; to do what it is our conscience is telling us to do; to do what we believe is fair and good….what we believe God wants us to do. And then, we screw it up! And…boom! We’ve written our own story. But, a heroine learns from her mistakes. She goes through a process of self-discovery. So, may we all have moments of self-discovery. And may we all be heroines (and heroes) in our own lives — via honesty, goodness and truth — as we live out our own stories. (The party continues. 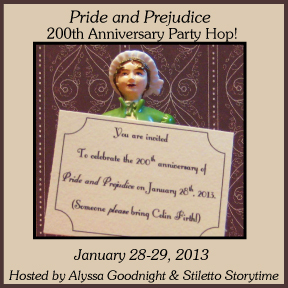 Remember to visit the Pride and Prejudice Party Hop blog to read more from Janeites all over the globe). Yes. I completely agree. I’ve been meditating on the cycle we seem to go on–the cycle of doing our best, failing or making a mistake, learning from it, building ourselves anew with this added wisdom gained, then repeating. Sometimes we repeat the same mistake to learn a new aspect about ourselves, sometimes it’s something completely different and unforeseen. That is one thing I completely love about Jane Austen’s characters, how their flaws allow them to grow and love. One reason I feel Ms Austens works live on…is her characters are human…they are flawed…they stumble..pick themselves up and go on…just like we still do 200 years later….